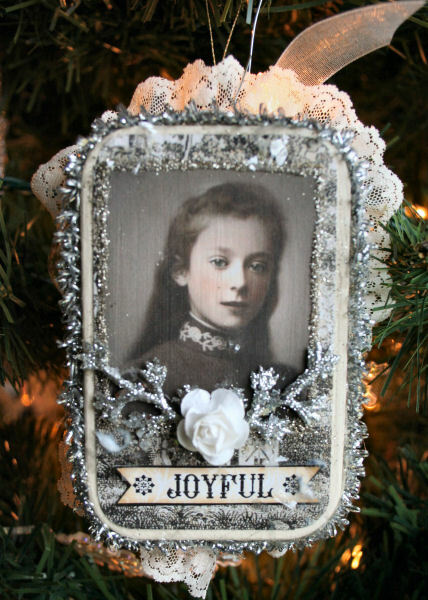 These sweet Yuletide Tin Box Ornaments have a vintage feeling of Christmas past. 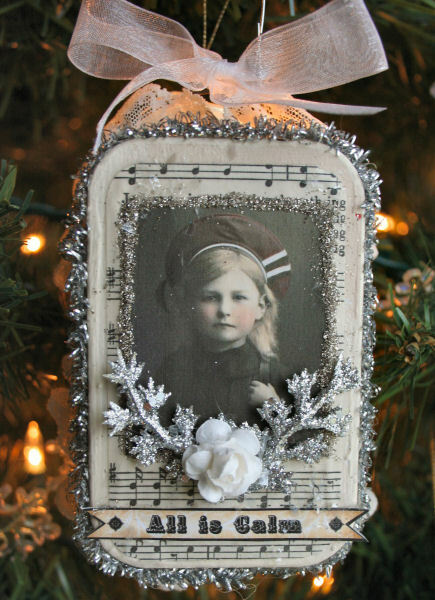 A gorgeous keepsake to give for any one you adore! They are beautiful on the Christmas tree, hung on packages and tied with a bow! Or make a set and hang on greenery above the fireplace. I promise you can’t make just one! Whoop! I have a whole drawer full of tins! These are stunning, Nancy!! Shoot….I need to win some more money…..I put my order in and I knew I should of gotten those tinsel stems!!! 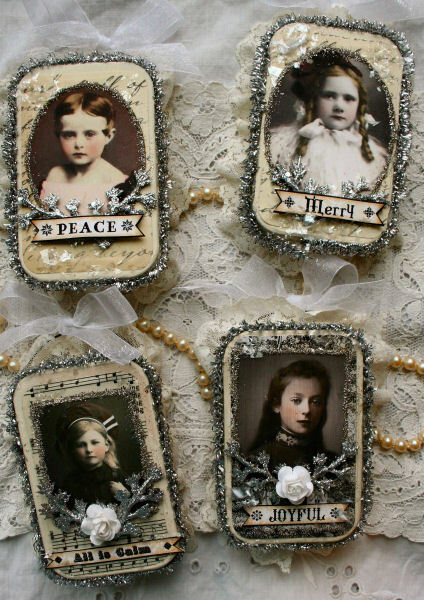 Because I really do love these Nancy…….so want to make one now!! LOL I will see what I can come up with…..so loving these “Twelve Days of Whimsy” I am having trouble keeping up with everything but love what I see and love what you create!!! 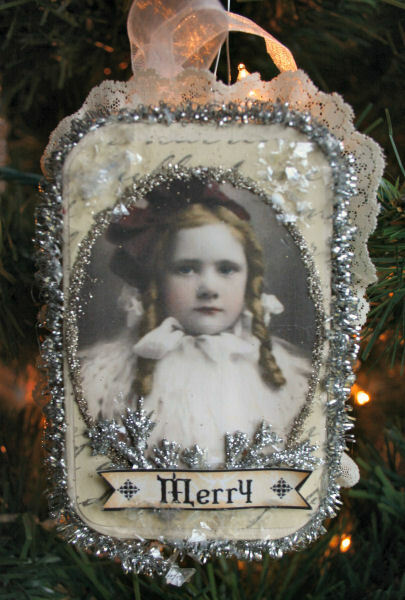 Nancy – these tin ornaments are so festive. So vintage and special with those beautiful faces and all that sparkle. Ok! These are my favourites so far!!!!! And thanks so much for the tutorial! You’ve just given me some quick Christmas gift ideas!!! I love these tins! I must make one! I love these ornaments, Nancy. A great use for all of those tins I have stashed away in a drawer. Oh what a wonderful idea for the christmas tree. Thank you for your hard work and inspiration and thank you Gale for the fabulous supplies! Be still, my heart! These are just soooo beautiful!!!!!! 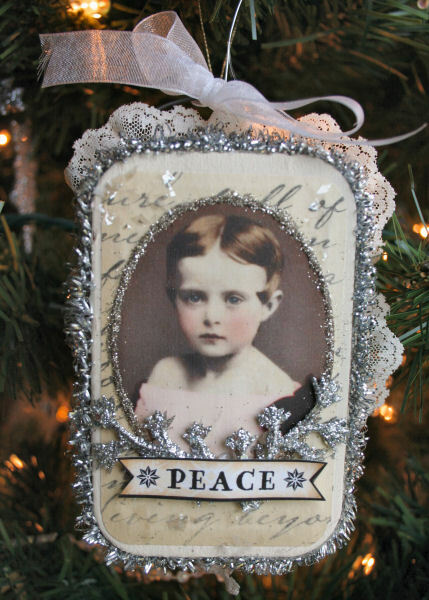 These would look so lovely on the tree. Now I know what what I have been saving my tins for. Thank you again for the inspiration Nancy these are just wonderful. Now I knew the tins I’ve been collecting would come in for something. :) So beautiful. What a clever and beautiful way to use tins, Nancy!! These are precious! Your muse just never quits!! Nancy these are awesome! You are a creative genius! One of Each Please! They are Gorgeous! I Love the New Sweet Faces that Gale has for us. Quite a Few in my Wish List! They are absolutely gorgeous,Nancy! Thanks so much for the tutorial.Have a wonderful day. You take something as “blah” as a little metal tin and make it into something sweet and beautiful…you have magic fingers Nancy. Whatever you touch turns to beauty — and these are no exception! On the sixth day of christmas my true love gave to me… six sparkling tins…These are oh so wonderful Nancy! Absolutely D.vine! I love them all…..can’t wait to try my hand at one. Oh my! These are lovely!!! I need to get caught up on all the days I missed… stupid cold! I have some bigger tins… love the tinsel and tags on these! Love these!!! Do I always say that? :-) But it’s true!!!!! I have several small tin boxes and never did anything with them. Now you have explained how to start with the gesso and the acrylic paint i will certainly use them. And the finished decoration is just adorable. Nancy, these are great! I’ll be making one of these – I have those tins waiting for an idea. Thanks for the Christmas inspiration and spirit. Would have never thought to use a tin this way! What a wonderful idea, luv your latest creation! 4. Time? I’ll try to squeeze this in! so beautiful and festive!! I have some paper mache shapes like this I can use-I have much to catch up on! these are gorgeous! I always love to look at your creations – you are so talented! Love them,they are stunning!thankyou for the inspiration and tutorial! Thumbs up!! Festive and sweet. I adore your little tins Nancy, On my bucket to do list this Christmas. Every year I have a bunch of these tins and never find anything really LOVELY to use them with. These are perfect. Thanks for the inspiration and thanks for not making us join facebook because I’m not on it. Lovely!!! Such great ideas this year!!! Oh my goodness, Nancy!!!! You have made each one of these pieces simply DIVINE!!! You are such a fabulous creative talent! You have really out-done yourself! Just lovely! Such a sweet idea Nancy, these tins are just beautiful!! Nancy , they are so beautiful, lovely with the tinsels around them-they will look so gorgeous everywhere, in our christmas homes. I still can`t find out how to become a follower of you and Paper Whimsy on Facebook- but I hope I`m in the fantastic generous giveaway anyway. 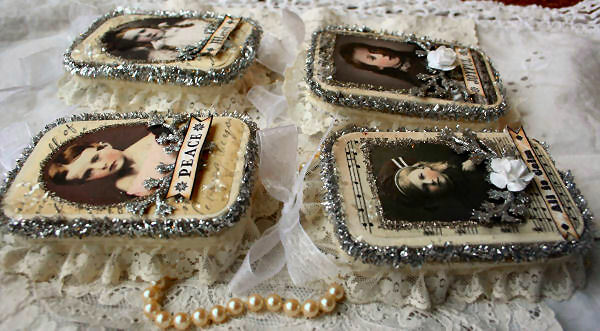 Nancy, These are beautiful, and just love the tin idea. Thank you for your sweet ideas and tons of inspiration. Oh my gosh, now I have to go out and buy some wee tins! These are beautiful Nancy, thanks so much for sharing! These are stunning! I have made days 4, 5 and 6 Projects today and will take some photos tomorrow. Looking forward to seeing what you will inspire us with for day 7! Nancy, I’m thrilled that you designed such a lovely project using tins!! I have been saving a bunch of them….and now I have something really nice to do with them…thanks to you! Gorgeous as always! Great idea! These are wonderful, sparkly, festive – love them! The gorgeous hits keep on coming! Love this! Oh my goodness Nancy! These are divine! I absolutely love them. Do you know if Gale has added extra hours to the day yet in the store? I certainly need time to stand still for everyone else while I get a few extra hours to create with all your inspiration! Just beautiful Nancy. What a lovely idea for a keepsake or something to put little trinkets in. Thank you again for wonderful inspiration. These tins are just too beautiful. Will look wonderful on my Xmas tree. Thanks for all your great ideas! Oh Boy Nancy.. Let me catch my breath. Simply Stunning!! So gorgeous, and great for tucking in a little gift! I am always in awe of your wonderful creations! Wonderful creation!!! Thanks for sharing!!! Nancy, I LOVE these ornaments made from tins! They are truly festive and merry!! Nancy, these tins look amazing! You are such the creation diva! Wow! Your tree must be looking really full by now. And beautiful! Awesome! Yes, you must show us your tree with all these beauties on it. Okay, these are too pretty. Can’t wait for Friday-my last day of school for two weeks. Hope I can squeeze in some time to creat. Ooooh great inspiration for all this tins I’ve been hoarding!!! !